A number of countries are strengthening their efforts to force Iran out of Syria and diminish Russia’s influence there at all costs. On 17 June unidentified airplanes struck a massive blow against the Syrian military and Iranian proxy forces in the region of Abu Kamal causing 200 deaths. It is noteworthy that the airstrike on Abu Kamal coincided with the decisive stage in the preparation of the Syrian Army for a military operation in Daraa, where assault forces with tanks and heavy artillery continue arriving. The role of the Russian air forces in the upcoming operation remains in question, since Iran and Hezbollah do not wish to leave this region, despite the mutual understanding reached among Damascus, Moscow and Tel Aviv with silent acquiescence from Tehran in May. 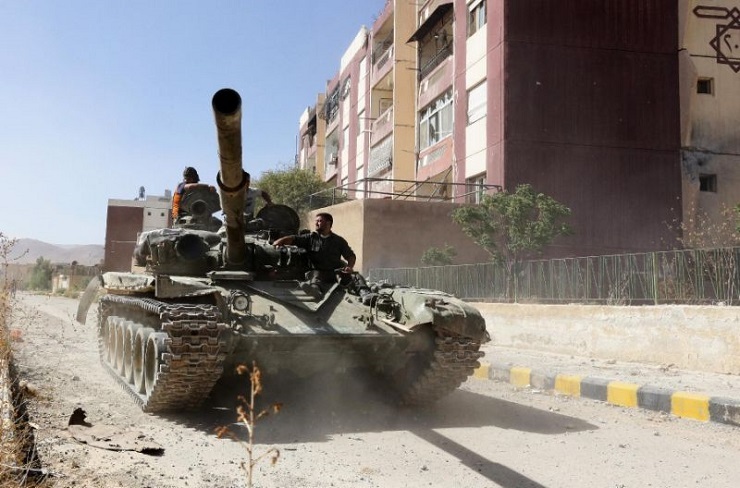 The involvement of pro-Iranian forces in the Daraa operation puts the possible participation in it of the Russian military in doubt, as this operation faces a threat of a retaliatory strike from the Saudi-American coalition and Israel. Hence it is quite possible that the strike on Abu Kamal served as a warning from the coalition and Tel Aviv, with Iran and Russia the intended targets of this “message”. So far Damascus and Moscow can not reach an agreement with Tehran, more precisely with the commanders of the Islamic Revolutionary Guard Corps, which is fighting in Syria autonomously without any involvement from the Iranian leadership. The powers of the official Iranian administration, i.e. the president and the government of the Islamic Republic of Iran, are limited when it comes to controlling the commanders of the Islamic Revolutionary Guard Corps, who answer only to the Supreme Leader of Iran, Khamenei. Moscow cooperates only with Iranian governmental institutions, which lowers Russia’s capabilities of collaborating with its military and political organizations. Having gathered sizable forces in the south of Syria in order to strike against the radical militarized opposition around Daraa, Assad is taking a substantial risk, since a fairly small area now houses almost all of his armed forces whose losses may be enormous if the coalition and Israeli air force launch an assault against them. However, the offensive is not possible, due to the Revolutionary Guard’s intransigent position in refusing to comply with the agreements reached by Russia and Israel regarding the withdrawal of the Pro-Iranian Shiite units and proxy forces from this “deescalation” zone near the Israeli-Syrian border. Officially, Syria and the Iraqi Shiite unit, al-Shaabi, rushed to accuse the US of the air strike, but the US denied any involvement in what had happened. On June 19, reports claiming that the air strike on Abu Kamal was executed by the Israeli air force began to appear. Obviously, the strategy aimed at forcing Iran out of Syria involves Israel and the coalition gradually shifting its assault on the Iranian proxy forces to this “narrowest” and most vulnerable area, on which the 120,000-strong pro-Iranian forces in Syria depend on for their supplies, i.e. “the Euphrates supply corridor”, used to ensure delivery of weapons, ammunition and human reinforcements from the Islamic Republic of Iran via Iraq to Syria by land. This “corridor” links territories, controlled by pro-Iranian units on both sides of the Syrian-Iraqi border. In fact, the Revolutionary Guard completely controls this part of Syria as well as the Iraqi territory on the other side of the river Euphrates. Both areas adjoining the Euphrates, belonging to two countries, are controlled in their entirety by the Iranian officials and not by local governments, under Syrian authority. Gradually families of the military personnel from the pro-Iranian Shiite military units are settling in these territories. The local Sunni population is being “diluted” by these Shiite “newcomers” from Iran and Iraq, who are quickly settling in, seizing land and establishing a support group for the new leadership. Tehran is keen on resettling Shiites in Sunni lands, as this is the surest way of retaining its grip on these territories in the long-term. Obviously, the US and all the regional players such as Israel, Saudi Arabia and Jordan understand what is happening, but they do not have enough time to prevent Iran from realizing its strategy of establishing a “Shiite corridor” from the Persian Gulf to the Libyan and Syrian shores of the Mediterranean Sea. At first, this strategy did not involve directly forcing the Sunni population out of the territories in West Iraq and East Syria, but the process of waging a war has led to this decision as this is the only way of securing the results of the “Iranian expansion” of the “Shiite Crescent”. In fact, Iranian policies towards Syria and Iraq involve changing the ethnoreligious make-up of the territories around the Euphrates by means of mass population resettlement. This is how the Revolutionary Guard is solving two tasks simultaneously, on the other hand, it is bringing vast territories under its control, and on the other, it is reducing social tensions in Iran since the armed forces for the war in Syria attract the most marginalized and alienated members of society, who are causing serious problems in the Islamic Republic of Iran. The social unrest during New Year in Iran was a vivid demonstration of this when it became apparent that the situation in the country is critical and resembles that of the “Arab Spring”. In a way Tehran’s expansion is somewhat forced, as it needs to move its “excess” population elsewhere. It either needs to destroy it in war as during the Iraqi-Iranian conflict when the ayatollahs decimated the surplus revolutionary masses who demanded the continuation of the revolutionary movement, or spread the population over a large territory. But first this land has to be conquered and cleansed of the local population. The Revolutionary Guard’s Major General Qasem Soleimani, the driving force behind the Iranian “expansion” in the region, is in charge of such policies, by combining the annihilation of the Shiite mercenaries during armed conflict with forcing the Sunni population out of the territories they have inhabited by custom. Israel and the Arabic countries in the region are extremely concerned about the Iranian strategy, which may reach a “point of no return”, i.e. when Tehran’s ambitions to control vast Arabic territories in Syria and Iraq can only be countered via a direct armed confrontation, which is both dangerous and unwelcome to everyone concerned. That’s the reason the US and Iran’s regional rivals, when analyzing the medium- and long-term consequences of Iran’s policies, have so little time to reverse the current course to their advantage. Hence, they are beginning to use tougher and tougher means of armed retaliation against Iranian policies, more specifically the Revolutionary Guard and Qasem Soleimani, having almost involved themselves in an outright war. In the meantime, under the “cover” of the battles in the East and South of Syria, both Turkish and US forces have started patrolling Manbij and its environs. Formally, the Turkish Army has not taken control over the city but the fact remains that Erdogan forced the Kurds to the left bank of the Euphrates by means of diplomacy and not force. His success is particularly noteworthy in the light of the upcoming presidential and parliamentary elections, an uncertain period for the Head of Turkey, who, according to all the polls, is not expected to win either the first or the second round of elections. If we were to believe the results of the polls, he will not receive more than 50% of the votes under any circumstances. Hence even an insignificant foreign policy win could alter the current pre-election equilibrium, considering that all the leading Turkish parties agree on the need to weaken the Kurdish forces. This notion is even supported by official Kurdish organizations, which fear the radical views of their “compatriots” fighting in Syria and Iraq. Overall, Erdogan does not have any disagreements with his political rivals on the issue of combatting the Kurdistan Workers’ Party and its “affiliates”. Meanwhile, naturally, occupying northern regions of Syria and establishing local governments controlled by Turkey there is helping Erdogan realize his strategic plan of removing Russia’s presence on the border between Turkey and Syria. Moscow’s bargaining position is thus weakened in its negotiations with Ankara on the Turkish Stream issue. If Russia were able to reach the border and take it under its control, Erdogan would have serious issues with the same Kurds but now under Moscow’s control. This could have become Russia’s crucial bargaining chip at the negotiations on Turkish Stream. Erdogan chose to confront Russia directly, by first shooting down the Russian fighter jet and then invading Syria, having conducted two military operations in the north of Syria at the expense of ceding Aleppo and more recently completing its operations in Manbij. If Erdogan remains President, the next issue he will solve in Syria will be Aleppo, a key Sunni city not only of the North but the entire country and the principal transport hub, large industrial and trade center with a large population (up to 2 million people). These factors make this city an attractive location for the future seat of the “free” Syrian government, a rival to Damascus, a notion supported by Turkey. The battle over Aleppo will inevitably result in a collision between Turkish and Iranian interests; however, Erdogan has already accomplished his key aim of forcing Russia out of the fight for the northern territories in Syria. From now onwards, he will solve all the issues regarding Aleppo only with Iranians and the Americans. For Moscow, this is clearly a significant loss in the Syrian war, as there is a high probability that the only export transit pipeline of TurkStream will not become a reality. Ankara will have to do with just one pipeline, for all of its internal needs, since its transit is guaranteed via the Southern Gas Corridor, opened on 12 June of this year. Turkey does not need to pick a fight over 15 billion cubic meters of “the blue fuel” with the USA and Europe, especially since the Southern Gas Corridor will carry gas from Qatar, Iran and Iraq.